I thought I would try something different. I have been wanting to include video of my vineyard and some of the techniques I use to grow grapes and make wine. To get started with it I experimented with some video of winemaking from back in 2004. My friend Rich Schell and I make wine together every year. Before planting my vineyard in 2001 we purchased all of our grapes from a local importer of California grapes. 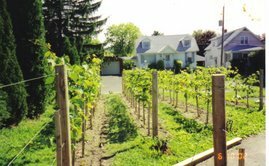 We still purchase some every year but now we also have our "estate grown" grapes from Villa Ruzzo Vineyards, my backyard of course. In the video I've uploaded from 2004, we are making Zinfandel. We bought 288lbs(8 crates ) of Zin and went to town. In the video you'll see the old Italian way of crushing the grapes. We've since gone hi-tech, but that was a lot of fun. 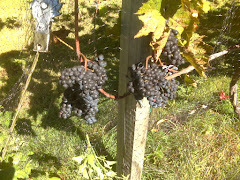 If this "test" video uploads and works, I'll put something together with video of my vineyard. This one is rough and it's a little dark. At the time we filmed it we weren't thinking about adding it to a blog. We just wanted to have some video of our winemaking to look back on and laugh. So please forgive the poor quality. What I'd really like to do in the near future, is make videos by subject and upload them. The first one will be on pruning and I plan on completing it in the spring of 2008 and then I'll upload it. I'm very much an amateur at making these videos and editing them . I'm sure I'll get better along the way but "you gotta start somewhere" right? Hope you enjoy it! No destemming eh? It looked as though that stomping fellow was just dropping the bunches, stems and all, into the vat. Was that zinfandel tanic? The wine was/is very tannic.But I like tannic wines, not herbaceous tannins. We did remove most of the stems after we crushed the grapes. We just "fished" them out, but some remained. Since we've been using the crusher/destemmer it has made our lives much easier. Although it still leaves the jacks (small parts of stem)in the must and we try to get those out too. good video, please tell me something, is this business really good? I mean with this you do some profit or just for hobby, because I want to produce wine with business propose. the technique is shown in the video was used in Egypt. Requires hard work and effort, but the results are extraordinary, great quality and isuperable taste. Backyard brewing is the best. Wether beer, wine or something a little stringer, home made is always BEST. Keep it up! Hello again!! I saw the video again and noticed there's no many stems on it, so.. How can you get a tannic wine by taking out them?